We adopted Elvis and Stan from yourselves at the begining of the year and after reading your Autumn CATchup we thought we would send you an update on them. As they had always been indoor cats, we had great fun watching them explore the garden for the first few times. They took to being out very well and are often found sunbathing or sitting on a roof watching the birds. Their daily routine is pretty regular, they go out in the morning and spend a while playing and hunting in the nearby farmers field, often bringing back presents. Elvis will come back for an afternoon snooze on the sofa while Stan will pop in every couple hours to make sure we are still here and see if any treats are on offer before going out again. 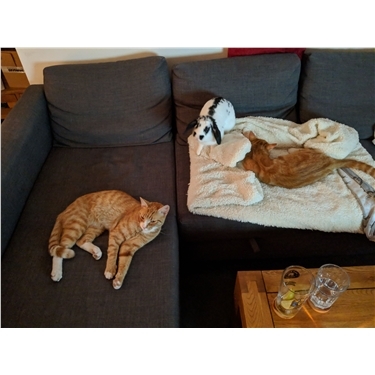 They are always both in by evening to clean each other (and the rabbit) then for a cuddle on the sofa. It took a little while and a lot of patience (on the cats behalf) but they now get on with Richard the rabbit when he's not jumping on them. They clean him as they clean each other and happily share their toys with him. We love coming home to these wonderful and loving cats, they even greet us on the pathway occasionally and come in with us. They always want fuss and often follow us round the house. Thank you so much them, our lives are certainly enriched with them in it.